I like the LEGO games, and I like The Lord of the Rings. 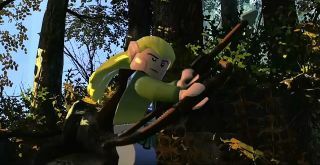 I also like the look of "LEGO LOTR." The official title, LEGO The Lord of the Rings with the "the," however, I don't love, but trademarks are trademarks. I'm also confused as to how the One Ring fits onto Frodo's claw. Maybe I'm just nitpicking now. Check out the E3 trailer , too, and find out why I'd better have a picture of Chris Thursten's stern look in my inbox tomorrow.